Dog treat pottery pet jar is MADE TO ORDER just for you! Please allow time for production. Imagine this cute little pet canister sitting on your counter top waiting to reward your pup! 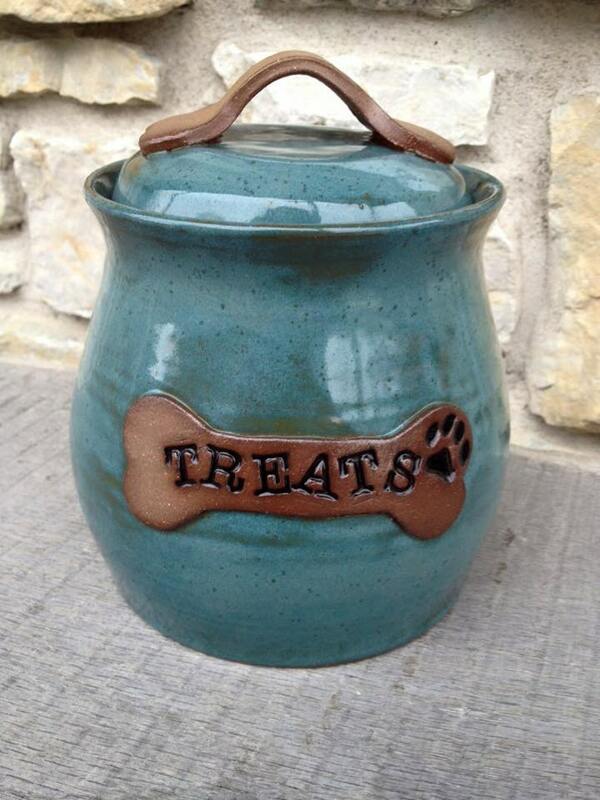 This dog treat jar is colored in an intense, food safe, opaque blue-green glaze over hazelnut stoneware. On this dog treat jar, the bone handle and name plate are left un-glazed for a beautifully rustic look. Your one-of-a-kind, hand-thrown pet treat canister can be personalized with your pets name instead of "treats" (up to 8 letters). Please include your pets name in the notes if you would like this option. This dog treat canister measures approx 7" high (with lid) x 6" at belly. It holds about 6 cups. Each piece is individually thrown, so exact measurements will vary. This is a stock photo. It looks beautiful and holds a LOT of treats for my dog! You can tell it's hand made with care. Also, it was packaged with extra care and arrived promptly. Love it! The pet treat jar is perfect! Takes a bit of time to arrive, but worth the wait. Well packaged. Nothing broken. Custom ordered and I'm so happy with my canisters!! So worth the wait. I will order from seller again. Thank you!! Love my new treat jar! High quality and looks just as described. Also very well packaged for safe shipping! Thank you!